Welcome to Day 2 of the Summer Soiree' here at A Simple Kinda Life! This giveaway is for the Moms! Joolwe.com has a great selection of jewelry, from Gold Over Silver Jewelry to Gold Plated Silver Necklaces and Pendants to even a Designer Jewelry Collection, as well as ELLE Jewelry. They have great Jewelry Deals, as well as a Jewelry Blog. While you're there, check out their Athena Jewelry, a beautiful variety of Designer Sterling Silver jewelry. I'm impressed with the selection and quality of this jewelry! Just gorgeous!!! 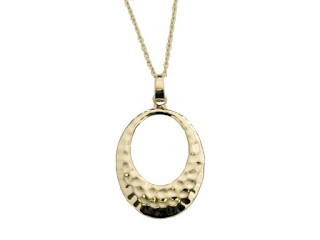 Would you like to enter to win this gorgeous 18K Gold Over Sterling Silver Hammered Oval Pendant? First, head over to the Joolwe.com Online Jewelry Store and pick out your favorite piece, then come back here and fill out the form below. For extra entries you can sign up for their Newsletter, blog about the giveaway with a link linking back here and to Joolwe.com Online Jewelry Store, be their Fan Joolwe on Facebook, Follow Joolwe on Twitter, and other extra entries as outlined in the form. This giveaway is open to all residents of the US and Canada and ends on June 30th at midnight. Remember to visit Everyday Baby Steps and Moody Mama Says for one extra entry each!